I’m often asked what are the best blogging tools for beginners, what blogging tools I use for our blog and what I would recommend. With over 29,000 plugins for WordPress on the market, picking the right tools for your blog can be overwhelming. Over the years, I have researched, tested and used many blogging resources; so, I thought of listing all the tools, plugins, and resources that I personally use either on this very website or for my work websites. I’m fond of everything listed here and I would strongly recommend it to my best friends or my mum (if she was a blogger). This list includes the best blogging tools for beginners and features either free tools or the most affordable options on the market, keeping in mind quality/price ratio and value for money. It’s a long list and you probably won’t remember the names of all the tools mentioned but you can pin this post for later reference. 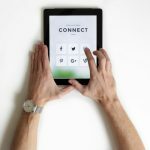 As tempting as free platforms can be, in my opinion, they’re only a good option for those who envisage their blog as a journal to share their thoughts or chronicle their journey for themselves or their family and friends. But, for those who wish for their blog to have a professional look, be read by as many people as possible around the world, and/or planning to fully monetize their blog and make it profitable, I would only recommend the industry standard: self-hosted WordPress – I mean the open source software WordPress.org (not WordPress.com). You can read why going self-hosted WordPress is the best decision you can make for your blog here. In that post, I also talk about the difference between WordPress.org and WordPress.com and why it’s not a good idea to have a blog on WordPress.com if you want to monetize your blog from the beginning or down the track. It may be difficult for new bloggers to grasp the difference between WordPress.org and the different plans on WordPress.com, so if you can do or not do on each platform is not clear to you, I would definitely recommend reading that post. If you decide to go for self-hosted WordPress (and you should), you need a domain and a shared hosting service (unless you have your own server where you could host your blog). In choosing your web host you should look more at the reliability, the reputation, and the customer service of the hosting service than the price. I understand that when you’re starting out, the upfront initial investment may be a concern and you would like to keep the cost as low as possible, but the cheapest is not always the best. What’s the point of saving a few dollars a month if then your website is down most of the time and no one can access it, not even yourself? Hosting with SiteGround and getting a domain name with Namecheap. On Namecheap domains are as cheap as 0.88 cents depending on availability and suffix. However, although a little bit more expensive, I would recommend getting a .com extension. This option has the benefit of keeping the hosting and the domain on two separate providers which may be safer. However, I use Siteground for both my hosting and my domain, I just find it easier that way. Alternatively, you could host with BlueHost which for the same cost would give you a domain for free included in the price. This option has the benefit of being cheaper and easier (you will only have to deal with one provider). If you paid 3 years upfront, your cost would be down even further and you could start your blog for as little as $2.95 a month. I have chosen Siteground for my website. I truly think Siteground is the best web host for bloggers and I recommend it to any new blogger. You can find here a step-by-step tutorial with pictures on how to start your own blog with Siteground. Once you have finished setting up with WordPress and either SiteGround or Bluehost, you will need to pick a theme for your website (basically, the layout). You could use a free WordPress one or you could get a premium one. The first option has the advantage of being free, but free themes come with limited functionalities, no obligation or support and of course, they’re not so unique (as many users use the same ones). If you want to have your own unique theme, here are my recommendations. They’re all very popular in the industry and offer many beautiful and affordable options. They’re fully customisable so you can make yours unique. I went for option three for this blog and I strongly recommend it. I use the Genesis Framework with Glam Pro as a child theme. I also have Food Pro (I have two premium themes). 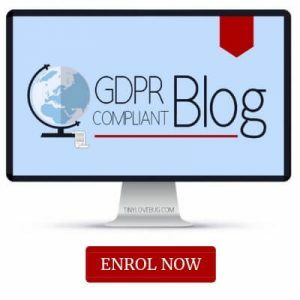 Blog legally: make your blog GDPR compliant with my course! If your aim is to get your blog posts read by as many people around the world as possible, I recommend using catchy headlines and optimising your posts for search engines in order to drive organic traffic to your posts. To pick the perfect headline, I use the free headline analyzer from CoShedule. In this post, we list other awesome blogging tools to find the perfect headlines for your blog posts. To optimise your posts for search engines, you can use the very popular and free WordPress plugin Yoast SEO. 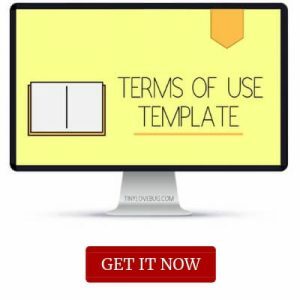 This plugin is only available for WordPress.org and the free version is only limited to one keyword. While I think Yoast SEO is a great starting point to double check your on-page SEO, I don’t recommend relying uniquely on a plugin for your SEO efforts. SEO is fundamental to your blog and you should learn at least the basics of a good SEO strategy. Start by getting our FREE guide to SEO strategies for new bloggers + printable checklist. You can apply these SEO strategies no matter what blogging platform you use for your blog. In order to drive organic traffic to your posts, you need to do some homework. Make sure you submit your sitemap and fetch the information relating to your site and your blog posts to search engines. Check the queries you are ranking for and improve on those. Pick the right keywords for which you are likely to rank in search engines. Check the competition to see whether it’s hard to beat it. Check what keywords your competitors are ranking for and try to beat them for the same keywords. Check your backlinks and try to get more. This seems a lot of work but with the right tools, you will only need to spend a few minutes per post to see great results. Here are the tools I use for this purpose. Together with Arefs, SEMrush is the best SEO tools out there. It’s what pro bloggers use and what you should use too if you’re serious about your SEO. These are all things that you can’t really do with free tools like the keyword planner for AdWords. First of all, the AdWords keyword planner is meant for paid campaigns in search engines and so its data are related to that kind of traffic. They don’t necessarily translate to organic traffic. Secondly, the AdWords keyword planner only offers you a wide range under the volume parameters instead of an exact figure. On the other hand, SEMrush offers a ton of accurate data that will make your SEO efforts super effective. Unfortunately, SEMrush is a premium tool which can be quite expensive for bloggers who are only starting out now. It starts at $99 a month. However, they have a free version (with very limited capabilities) and they offer a free trial so I thought of mentioning this tool here anyway because SEMrush really is a game changer in your SEO strategy and traffic growth. If you’re on a tight budget and you can’t afford SEMrush, don’t despair, I got the perfect solution for you: Keysearch. Keysearch lets you do the same things that you can do with SEMrush but at a fraction of the price. Of course, there is a substantial difference in terms of performance between these two tools. For example, SEMrush is able to discover backlinks with much more accuracy than Keysearch. But Keysearch still offers a solid performance and covers everything you will probably ever need for your blog’s SEO. I use Keysearch on a daily basis to brainstorm keywords, assess their search volume and competition difficulty, and I must say I’m pretty happy with this tool. You can try for free some of its feature and capabilities here. No payment details required. Or if you would like to try all its features and capabilities, it only costs $17 a month (or way less if you pay yearly), but if you use my discount code KSDISC you will get 20% OFF. You can sign up here. Another tool that I have only recently discovered but I’m already using it on a daily basis and absolutely loving it is SEMScoop. It offers all the same features as its competitors – if not more! – but at a fraction of the price! It comes with an SEO difficulty tools, advanced links profile, content quality score and much more! The best part is it comes with a FREE plan for how long as you like… so you would really be a fool not to try it out! You can check SEMScoop out here. I would also add a widget displaying related posts to all your blog posts in order to keep your readers engaged with your content longer and lower your bounce rate. The WordPress plugin I use for this purpose is WordPress Related Posts by Sovrn. Many bloggers use Grammarly to proofread their blog or social media posts before publishing. I use it myself and have found that it’s a great tool to check your spelling and typos, and the best part is, even the free version works wonders for this purpose so definitely get it for your blog! However, if you’re not a native speaker or if grammar is not really your forte, I wouldn’t probably rely uniquely on software as it may have too many limitations in understanding the context and applying the right grammar and syntax rules. So, in this case, I would instead get “a pair of human eyes” to proofread your posts. You can find professional proof-readers on Fiverr with their rates starting as low as 5 dollars. We use the services of a proof-reader for some of our content. Her fees are not as low as some on Fiverr but we’re really happy with her impeccable work, thoroughness and flexibility! To create featured images, thumbnails, and pins for our blog posts, I use Unsplash, Pixabay, and Pexels to download high-quality public domain photos, illustrations and vector graphics for FREE and I then use Canva and Visme to edit them to create unique and branded images and graphics. I have actually upgraded to Canva for work in order to use transparent backgrounds, resize images with just one click, and have access to thousands of additional free images, but otherwise, pretty much everything you need can be done with the free version. I also use beautiful stock photos from membership sites such as Ivory Mix, Haute Stock, and PixieStock. The best place to find premium fonts, themes, graphics, photos, templates, add-ons, 3D assets, and more are TheHungryJPEG and Creative Market. Once you sign up for free, they regularly send you FREE goodies. You can read my review of TheHungryJPEG here. There are lots of free options for free share bars. I find Shareaholic is a good option even though it might slow your website a bit. Another popular option amongst blogger is SumoMe. I have tried it but didn’t like it much. It slows your site and you can’t get rid of the SumoMe branding. I personally use the Social Warfare plugin and I couldn’t be happier. In addition to providing you with social share buttons, Social Warfare lets you upload a custom Pinterest image together with a custom description so that when someone clicks on the pin button, the exact image (and only that image) and description will show up. It also allows you to decide exactly which image, title, and description would appear when your post is shared on Facebook or Google+, and lets you pre-write a custom tweet when your post is shared on Twitter. Social Warfare is also quite affordable at only US$ 29 a year. I definitely recommend this plugin. To attract followers to my social media accounts, I use the MiloTree popup. You can link Instagram, Facebook, Pinterest and your email list. Many bloggers use either the CommentLuv plugin or Disqus as the comment system for their blog. Although they both have their benefits, I personally don’t recommend either of them. CommentLuv allows readers to include a link to their latest post in their comment. This definitely encourages people to leave comments which is good for your blog engagement but at the same time, 1. it attracts spam comments, 2. negatively affect your on-page SEO since most of these links (albeit no follow) are usually irrelevant to the content of your post. I don’t like Disqus because it makes you go through so many hoops before being able to leave a comment that the whole process seems too ridiculously demanding to me. Below you will see a quote from a previous version of this post. I no longer recommend the Facebook comment plugin. Facebook Plugin with its mirroring feature. The way it works is that readers can leave a comment by logging into their Facebook account. Once they leave a comment under a blog post on this website, it will also appear under the corresponding post on Tinylovebug’s Facebook Page and vice versa. How many times have you shared your blog post on your Facebook Page only to see an amazing, insightful comment underneath and wonder why they didn’t comment on the actual blog?? This comment system solves the problem! For those shy readers who don’t like leaving comments through their Facebook account, I added a second comment system by which they can comment via their own blog URL or even anonymously. The mirroring feature of this plugin has been deprecated and is no longer available. When I migrated from Squarespace business plan to self-hosted WordPress I lost most of my comments. I was able to retrieve and retain the comments that were left through the regular comment box but not those left through the Facebook comments plugin which were the vast majority. As usual, it’s not a good idea to rely on external platforms for your blog. Anything can change and you won’t have much say in it. If you want full control over things better to keep your comment system within your own self-hosted blog. I now only use the WordPress comment system and to prevent spam comments, I use the free Askimet plugin. 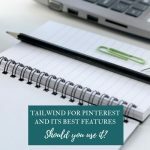 If there is a thing I would recommend investing to boost your traffic is Pinterest and Tailwind. Tailwind is a scheduler for Pinterest and Instagram. Since we started using Tailwind, our Pinterest monthly views increased by + 339% in the first month and our traffic skyrocketed. So, I definitely recommend using Tailwind. They have a FREE trial, so you can try it for yourself. They don’t even ask for your credit card details when you sign up for a trial. Scheduling pins: Tailwind lets you add all the pins you like at one time and it then publishes them for you at different times. Tailwind Tribes: Tailwind Tribes are community boards created within Tailwind. In other words, they’re a great place to share your pins for others to re-pin, and where to find high traffic content for you to re-pin. Tribes are currently FREE to use. You can join our Facebook Group and you will find an invitation to our Tribes and Pinterest Group Boards in a pinned post. Start a FREE trial with Tailwind today. No payment details required. Try it out for free, I’m 100% sure you will love it! 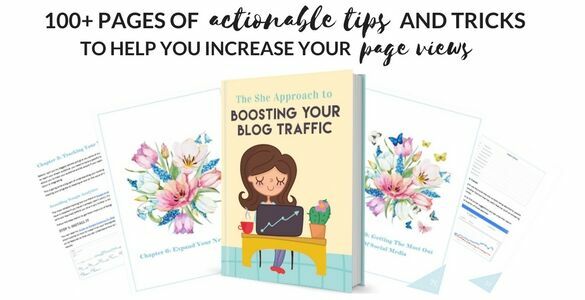 If you want to know more about how to increase the traffic to your blog exponentially, I suggest purchasing the e-book The She Approach to Boosting Your Blog Traffic. It’s an e-book that I would recommend to any bloggers, regardless of their level, because it’s quite affordable but its value transcends its price enormously. It really is an incredibly valuable resource jam-packed with actionable tips. You can get your copy here for only US$ 25, and start skyrocketing your traffic today! is an email marketing provider specifically designed for bloggers. So, you can be sure that your newsletter “10 easy ways to earn money from home” won’t get your account suspended as spammy because, unlike most other email marketing out there, ConvertKit knows exactly what you mean. Another reason to choose ConvertKit is its awesome segmenting feature by which you can send different newsletters to your subscribers depending on their interests. Other great features include opt-in forms you can add within your posts, time zone based email scheduling, and automated email sequences. The opening rate with ConvertKit is very high and if you want to take your blog to the next level, ConvertKit is definitely the way to go! so give ConvertKit a try now and see for yourself! If you’re already with a different email marketing provider, no problem, you can import your previous list within seconds. It’s a very easy to use drag and drop email marketing services FREE up to 1000 subscribers. Another popular option among bloggers is MailChimp. I have tried it but I find Mailerlite is a much better tool. Plus, unlike MailChimp, Mailerlite offers all its premium features on the free plan, including 24/7 support (which is great when you’re starting out and trying to figure out how things work) so it’s really a no-brainer for me. In terms of affiliate programs, most bloggers start with Amazon Associates. That’s not only because Amazon is one of the most popular and trusted brands but also because they have so many products that it would be impossible not to find something relevant to your niche to promote. However, their affiliate commission is not very high, and they have so many rules and restrictions on how, what, where, and to whom you can promote your affiliate links. So, in addition to – or instead of – Amazon Associates, I recommend joining these amazing affiliate programs. The earnings from different merchants are consolidated in only one account, instead of having money sitting in different accounts waiting to reach the payout threshold. You can join ShareASale for FREE here. Unlike any other affiliate network, you don’t need to apply for each affiliate program individually. Once you join Skimlinks, you automatically become an affiliate for over 20,000 merchants, including Amazon and e-bay, but all your earnings will be consolidated in your Skimlinks account. Unlike any other affiliate network, you don’t need to use specific affiliate links but Skimlinks will make regular links your affiliate links. Skimilinks does get a commission on your earnings but due to a volume of their sales, they were able to negotiate with their merchants a way higher commission than what you would get if you flew solo so the fact that they retain a commission doesn’t really affect your earnings. You can join Skimlinks for FREE here. With over 6,000 merchants covering every niche, this is another great affiliate program to join. The only catch is that they require a $5 admission fee but you will get it back with your first payout. Ultimate Bundles are collections of online resources sold at the whopping discount of 90-98% OFF the original price. Some bundles are open for sale for a limited amount of time (usually 5 days) while others are evergreen and are available all year around. When you join the affiliate program, you also get FREE marketing training from the insightful and resourceful Ultimate Bundles Team. This a very useful plugin to manage and track all your affiliate links. First of all, Pretty Links converts your long and ugly affiliate links into nice and short links of your choice. Secondly, it offers useful stats detailing the number of times a link was clicked and where from. It’s always hard to keep track of your affiliate marketing, but this plugin makes your life much easier. It also gives you a boost since people are more likely to click on a nice and clean link containing your domain than a long and unreadable link that looks way too spammy. You can get the Pretty Links plugin here. A free alternative to Pretty link is ThristyAffiliates. It makes incredibly easier to add links and banners to your posts and makes your links pretty, however it doesn’t provide any stats on clicks and performance. To make all my affiliate links no follow, I use the free Ultimate No Follow plugin, and to automatically add a disclosure to my posts, I use the free FMCT Affiliate Disclosure plugin. For my own affiliate program, I use the WordPress Affiliate plugin. This is not a free plugin but it’s quite affordable: a one-time payment of $49.95. 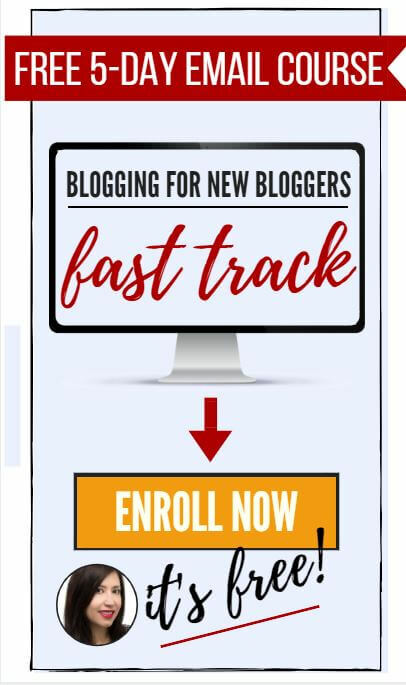 I have chosen over other options because in addition to sales, it lets you track leads too so that I can reward my affiliates even when they refer people to my FREE course Bloggers for New Bloggers Fast-Track. Michelle is one of the most successful bloggers in the world. She is only in her late twenties and makes over $50K a month through affiliate marketing, and in her course, she shares all her winning strategies and secrets. Her course is a bit pricey but she really goes through everything you need to know about affiliate marketing to be successful at it. So, if you take her course, you will make your initial investment through affiliate marketing in no time. No wonder why this is the most popular affiliate marketing course amongst bloggers. Her comprehensive course consists of 6 modules, over 30 lessons, over 20 worksheets, plus several bonuses. It also comes with access to a very supportive exclusive Facebook group where you get the chance to get help and feedback from other students of the course and even Michelle herself. 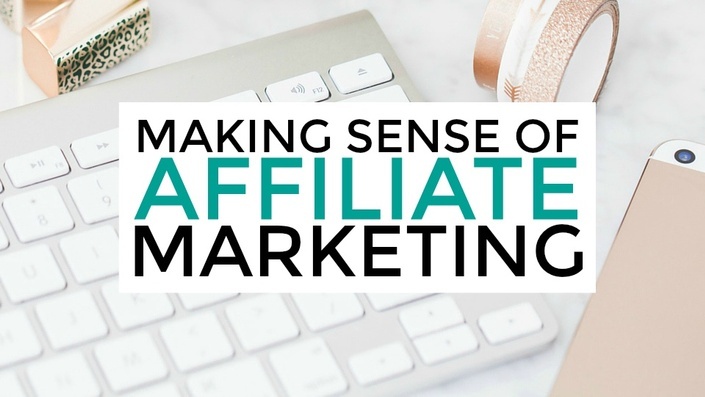 You can read my review of Making Sense of Affiliate Marketing here. You can enroll in the course here. 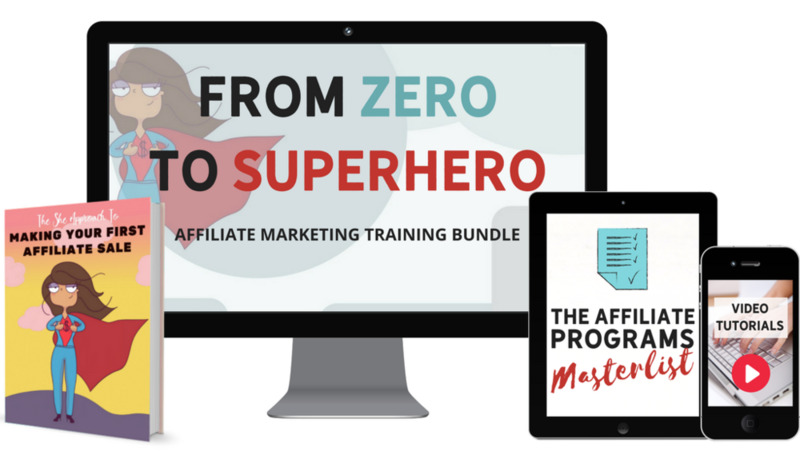 If you’re a beginner on a tight budget but eager to start affiliate marketing the right way, in the meantime, I would recommend getting the From Zero to Superhero bundle from The She Approach. This bundle is a fantastic collection of resources and tutorials including a 50+ pages e-book, video tutorials and access to a private Facebook Group. You can get a copy of the From Zero to Superhero Bundle here. Blogging is a lot of work and can become overwhelming pretty easily. 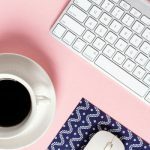 If there are things that you don’t know how to do or that take too much time for you to do on your own, I would suggest outsourcing some of your blogging tasks. If you don’t want to deal with the headache of building your self-hosted WordPress blog, I recommend getting in tough with EagleWP. They have a team of experienced and knowledgeable WordPress developers and they offer different packages depending on your needs and budget. You can have a look at EagleWP services and packages here. You can also find web designers, social media managers, SEO experts, proof-readers, VAs, email marketers and any other kind of help and support on Fiverr. The rates of the gigs are super affordable starting as low as US$ 5. Fiverr offers a pretty good rating system which will help you pick the right gig for you. Plus, lots of reviews from other users are available for you to read before going ahead with a gig. Many bloggers have had their logo made by someone on Fiverr or used other services from there. If you’re not comfortable with outsourcing, you could learn new skills yourself without spending too much. I recommend checking out Udemy. 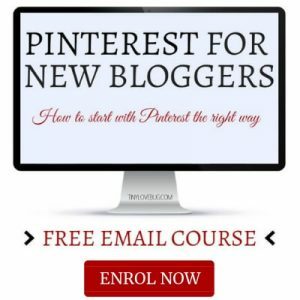 They offer over 5,000 courses on a ton of topics relevant to blogging at very affordable prices. And, as if their prices weren’t already amazingly cheap, they regularly run 90-98% OFF discounts. So, you could enrol in a great course for as little as US$ 10! You can start learning on Udemy today here. 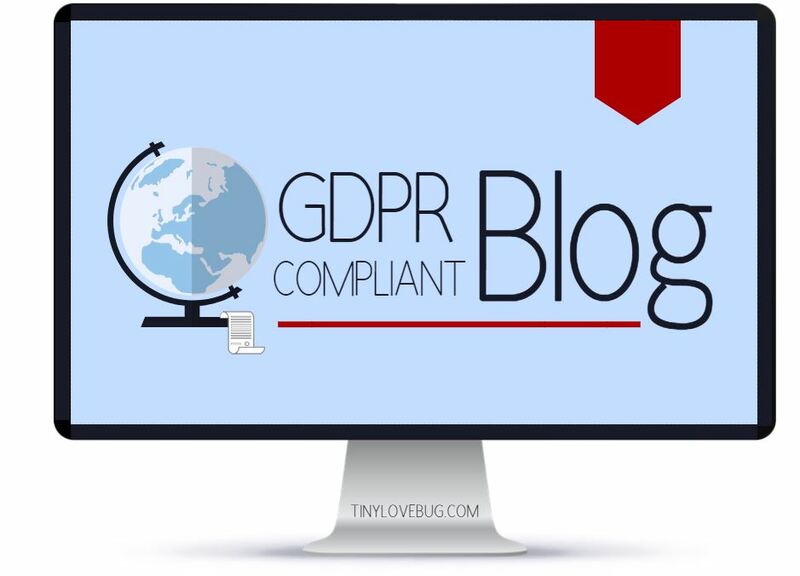 Is the GDPR hard to understand? Yes, it is! But don’t you worry, I’m a lawyer and expert in EU law (PhD) and I’ve made it super simple for you in my course! To sell digital products I use Woocommerce which is free. Another popular option is SendOwl. They have an easy integration with many online payment systems including Paypal and Stripe. SendOwl will track everything for you and if you want to start your own affiliate program, it will track the sales and commissions of your affiliates too. Best part is they don’t charge a commission on your earnings but they offer a very affordable flat monthly fee. You can start with SendOwl here. If you’re planning to run a giveaway or a competition, I recommend Gleam.io. We used it for our own giveaway and absolutely loved it! It randomly select the winner for you. They have a FREE version. We used the paid version but the great thing is they allow you to upgrade and downgrade monthly as you go, so if you wanted, you could just upgrade to the paid version for the time of the giveaway and then revert back to the free version once the competition ends. I have researched other tools for giveaways, and those offering extra entries for referrals and integration with email marketing providers, were ridiculously expensive (something like US$ 150/200)! You can learn more about Gleam.io here. 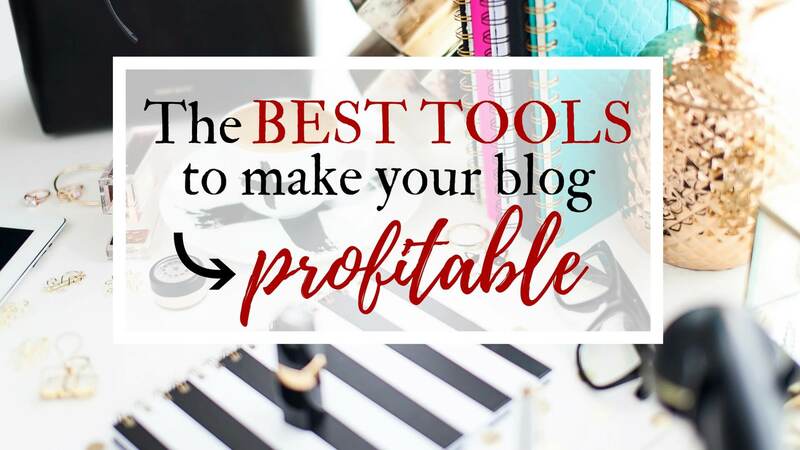 There are some more tools that I use for this blog and absolutely love, so I will keep updating this post with additional tools that can be useful to other bloggers. Let me know in the comments if you have tried the tools listed here and if there are some that were not included in this list but you would definitely recommend to others. Hi there! I’m the founder of Tinylovebug and so glad to have you here! In addition to blogging, I have worked as a lawyer, a lecturer (PhD), and a manager in different countries for the past several years. I now use the combination of my research, teaching, and blogging experience to show new bloggers, like you, how to start and run a profitable blog. Whether you want to grow your traffic or make money blogging, I will help you achieve your full potential! 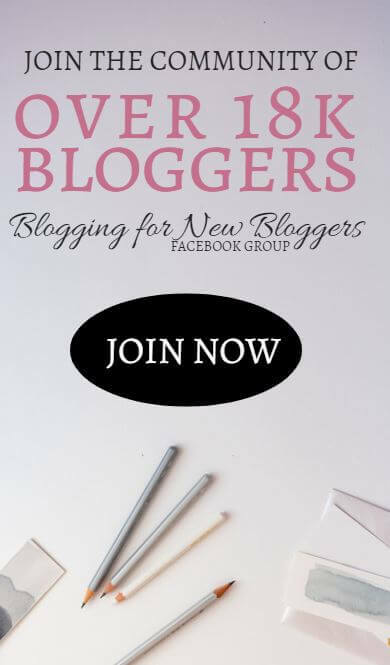 Take my FREE course - Blogging for New Bloggers Fast Track and set yourself apart from the average new blogger! Very comprehensive list of ways to monetize your blog! I’ve heard of most of them already but it was nice to find some new information as well! Thanks, Kanicia! Happy to hear you found some new information. Great tips and tools to look into! What a thorough post! Excellent post. This could help any new blogger. Great tips and excellent post here. I love your analysis on commentluv and disqus. I truly experience challenge when i try to sign into other bloggers and a little more challenges. Thanks for the enlightenment. Absolutely! If I have to go through too many hoops to leave a comment, I just don’t bother. You’re very welcome. Thanks for stopping by, Elly! Thanks, Severina! I still haven’t finished it yet, I want to add a few more tools I love and some really useful ones to keep your blog safe and secure. I feel I will never finish this post aaarrghh! Hi! Thanks for the great post– I’ve subscribed to your newsletter and I’m looking forward to receiving the SEO book! 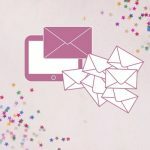 About MailerLite, how do you guys get your new subscribers right over to your list? I collect them with Sumo and I have to manually add them to my MailerLite list. Is that what you do? Thanks again for the great info! Thank you, Nicole! 🙂 No, I do everything on Mailerlite: collect subscribers through pop-ups, embedded forms or landing pages via Mailerlite and they’re automatically added to the list in Mailerlite. Adding your subscribers manually to Mailerlite is too time-consuming, especially when you will start getting 100+ subscribers a day (and you will!). Plus, I’m not sure this is the best method anyway because you would want to have evidence of how they got added to your list to prove their full consent, while now you’re basically adding them yourself (even though you genuinely collected their email addresses with Sumo, but still better to have consistent data). So I would recommend doing everything through Mailerlite. If you really want to keep collecting via Sumo, I would suggest looking into connecting your Sumo with your Mailerlite through Zapier so that you don’t have to do it manually yourself each time. Hope this helps. Let me know if you have any questions. I was wondering how I can get income from my blog as I have a good audience, I didn’t really get the Giveaway system but I will read it again from the site you provided. A really comprehensive and useful article! thanks for sharing! Great tips! Very informative post. Such a big help to new bloggers. Thanks for sharing ♥️ ♥️ By any chance you are interested on doing collaborations, you can check out the collaborations portal of Phlanx.com and connect with amazing brands! This is a very amazing article and the content is very nicely displayed. This is a super comprehensive list and I learned a lot from it! I’ve been looking for an Amazon Associates alternative as well as a Related Posts widget, and now I’ve found them 🙂 Thanks! I love your content! I have pinned this to refer to again in the future. Wow what a great blog post! I’ve learned so much!! I’ve spent the last hour going through about half of it and applying your suggestions. I need to get through the rest! This has been one of the most helpful posts I’ve read! Thank you! This was such an interesting and thorough post! I didn’t know about that headline checker website and have saved it for use later. I’m still trying to figure out this blogging thing and it’s hard work.I’m getting some useful info from your blog. Thank you.